Pulse oximetry is one of the most commonly employed monitoringmodalities in the critical care setting. This review describes the latesttechnological advances in the field of pulse oximetry. Accuracy of pulseoximeters and their limitations are critically examined. Finally, the existingdata regarding the clinical applications and cost-effectiveness of pulseoximeters are discussed. The human eye is poor at recognizing hypoxemia. Even under idealconditions, skilled observers cannot consistently detect hypoxemia until theoxygen (O2) saturation is below 80% . Thedifficulty that physicians have in detecting hypoxemia was recently exemplifiedin a study of over 14000 patients being evaluated at the UCLA EmergencyDepartment . Patients were monitored by oximetry butrecordings were given to physicians only after they completed their initialassessment. Changes in diagnostic testing and treatment were most likely at anO2 saturation of 89%, and changes were actually less common at lowersaturations, probably because the physicians were able to detect evidence ofhypoxemia without requiring a pulse oximeter. With the proliferation of pulse oximeters in different locations ofthe hospital throughout the 1980s, several investigators demonstrated thatepisodic hypoxemia is much more common than previously suspected with anincidence ranging from 20-82% [3,4,5] (Fig. 1). Thesignificance of episodic desaturation on patient outcome is largely unknown. In patients admitted to a general medical service,Bowton et al. found that O2saturation < 90% of at least 5 min duration occurred in 26% of the patients.On follow-up over the next 4-7 months, those patients experiencing hypoxemiaduring the first 24 h of hospitalization had more than a threefold highermortality than patients who did not desaturate. Although episodic desaturationmay simply be a marker of increased risk rather than the direct cause ofdecreased survival, an increased mortality rate was still observed in patientswith episodic hypoxemia when the investigators corrected for severity ofillness. Whether or not the early detection and treatment of episodic hypoxemiacan affect patient outcome remains unknown. 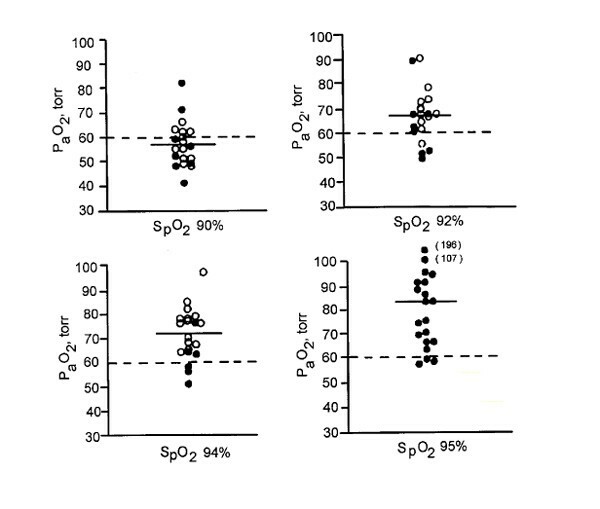 Sequential distribution plots of oxygen saturation at intervals of2 min over a 3-h period in a stable patient (A) and unstable patient (B). Theunstable patient shows episodic desaturations. Published with permission . Pulse oximetry is based on two physical principles: (a) the presenceof a pulsatile signal generated by arterial blood, which is relativelyindependent of non-pulsatile arterial blood, venous and capillary blood, andother tissues; and (b) the fact that oxyhemoglobin (O2Hb) andreduced hemoglobin (Hb) have different absorption spectra . Currently available oximeters use two light-emitting diodes (LEDs) that emit light at the 660 nm (red) and the 940 nm (infrared) wavelengths.These two wavelengths are used because O2Hb and Hb have differentabsorption spectra at these particular wavelengths. In the red region,O2Hb absorbs less light than Hb, while the reverse occurs in theinfrared region. The ratio of absorbencies at these two wavelengths iscalibrated empirically against direct measurements of arterial blood oxygensaturation (SaO2) in volunteers, and theresulting calibration algorithm is stored in a digital microprocessor withinthe pulse oximeter. During subsequent use, the calibration curve is used togenerate the pulse oximeter's estimate of arterial saturation(SpO2) [9,10] (Fig. 2). 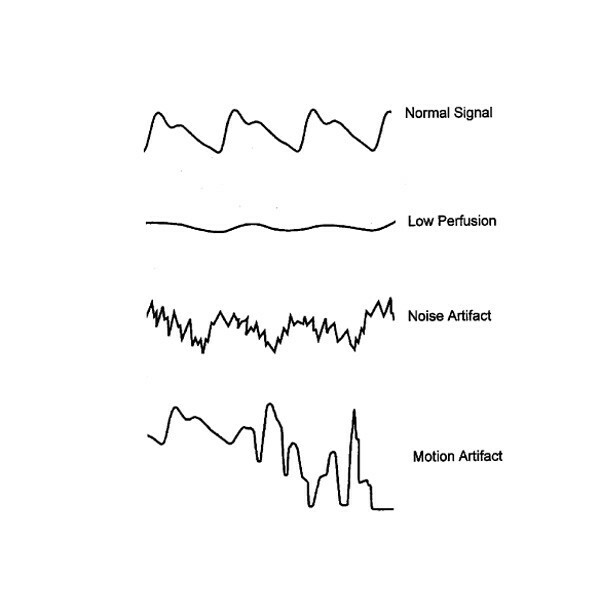 In addition to the digitalreadout of O2 saturation, most pulse oximeters display aplethysmographic waveform which can help clinicians distinguish an artifactualsignal from the true signal (Fig. 3). Red (R) and infrared (IR) scaled alternating current (AC) signals at arterial oxygen saturation (SaO2) of 0%, 85% and 100%. 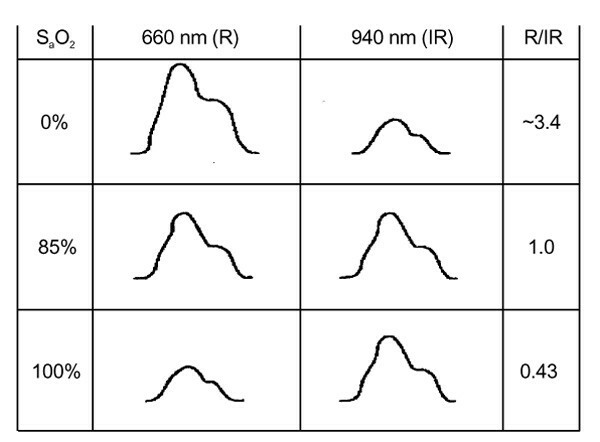 The numeric value of the red-to-infrared (R/IR) ratio can be easily converted to SaO2. Published with permission . Common pulsatile signals on a pulse oximeter. (Top panel) Normal signal showing the sharp waveform with a clear dicrotic notch. (Second panel) Pulsatile signal during low perfusion showing a typical sine wave. (Third panel) Pulsatile signal with superimposed noise artifact giving a jagged appearance. (Lowest panel) Pulsatile signal during motion artifact showing an erratic waveform. Published with permission . The accuracy of commercially available oximeters differ widely,probably because of the different algorithms employed in signal processing. These algorithms are limited by the range ofsaturations that can be safely obtained in volunteers, and also the accuracy ofthe measurement standard (CO-oximeter) . Comparisonof pulse oximetry with direct CO-oximeter measurements should be reported interms of the mean difference between the two techniques (bias) and the standarddeviation of the differences (precision). In healthy volunteers, oximeters commonly have a mean difference(bias) of < 2% and a standard deviation (precision) of < 3% whenSaO2 is 90% or above [12,13]. Comparable results have also been obtained in critically ill patients with good arterial perfusion [14,15]. Accuracy of pulseoximetersdeteriorates when SaO2 falls to 80% or less. Inhealthy volunteers under hypoxic conditions, bias of pulse oximetry varies from-15.0 to 13.1 while the precision ranges from 1.0 to 16.0 [12,16,17,18]. In a study in critically ill patients, eight out of 13oximeters had a bias ≥ ± 5% when SaO2was < 80% . In a study of 54 ventilator-dependentpatients, the accuracy of oximetry deteriorated significantly at lowSaO2 values. Bias ± precision was 1.7 ± 1.2% for SaO2 values > 90%, and it increased to 5.1 ± 2.7% when SaO2 was ≤ 90% . Different probes that are used with a pulse oximeter can also affectthe accuracy of SpO2 measurements. Inpatientswith poor peripheral perfusion as a consequence of car-diopulmonarybypass surgery, finger probes had lower precision and more readings within 3%of the reference (CO-oximeter) than the other probes. Overall rankings weresignificantly better for the finger probes than probes on other sites (Fig.4) . The response time ofoximeter probes was assessed by Severinghaus and Naifeh  who induced 30-60s hypoxic plateaus between anSaO2 of 40 and 70% in healthy volunteers.Oximeter probes placed on the ear generally had a much faster response to asudden decrease in fractional inspired oxygen concentration(FiO2) than did the finger probes (10-20 versus24-35s, repectively). Employing hypobaric facility to induce hypoxia in normalvolunteers, Young et al. also observedthat the response time of the finger probes were slower than the ear probes inresponse to either a decrease or increase in O2 saturation. 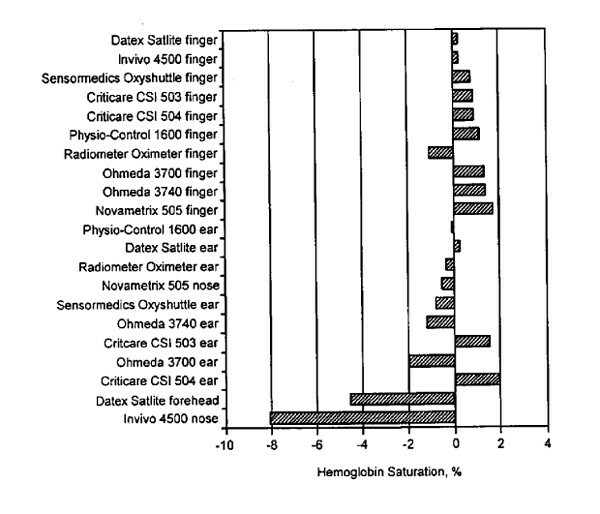 Pulse oximeter probes placed on the finger, ear, nose or foreheadranked for accuracy in terms of bias under conditions of poor perfusion. Biasof pulse oximeters ranged from 0.2 to 1.7 for finger probes and 0.1 to 8.1 forother probes. Adapted with permission . Oximeters have a number of limitations which may lead to inaccuratereadings (Table 1). Pulse oximeters measureSaO2 that is physiologically related to arterialoxygen tension (P a O2) according to the O2Hbdissociation curve. Because the O2Hb dissociation curve has asigmoid shape, oximetry is relatively insensitive in detecting the developmentof hypoxemia in patients with high baseline levels ofPaO2 [11,22]. Pulse oximeters employ only two wavelengths of light and, thus, candistinguish only two substances, Hb and O2Hb. When carboxyhemoglobin(COHb) and methemoglobin (MetHb) are also present, four wavelengths arerequired to determine the 'fractional SaO2': i.e.,(O2Hb × 100)/(Hb + O2Hb + COHb + MetHb). In the presence ofelevated COHb levels, oximetry consistently over- estimated the trueSaO2 [23,24] by the amount of COHb present. Elevated MetHb levels also may cause inaccurate oximetry readings [25,26]. Anemia does not appear to affect the accuracy of pulse oximetry: in non-hypoxemic patients with acute anemia (mean Hb, 5.2 ± 0.3(SE) g/dl), pulse oximetry was accurate in measuring O2 saturationwith abias of only 0.53% . However, in patients withsickle cell anemia presenting with acute vaso-occlusive crisis , mean bias of pulse oximetry was 4.5% (in some patients it was as high as 8%), which was significantly greater than in a control group ofpatients without sickle cell anemia. Severe hyperbilirubinemia (mean bilirubin,30.6 mg/dl) does not effect the accuracy of pulse oximetry . Intravenous dyes such as methylene blue, indocyaninegreen, and indigocarmine can cause falsely low SpO2 readings, an effect that persists for up to 20 min . Nail polish, if blue, green or black, causes inaccurate SpO2 readings ,whereas acrylic nails do not interfere with pulse oximetry readings . Falsely low and high SpO2 readings occur with fluorescent and xenon arc surgical lamps . Motion artifact continues to be a significant source of error andfalse alarms [35,36,37,38]. In a recent, prospective study in an intensive care unit (ICU) setting, SpO2signals accounted for almost half of a total of 2525 false alarms  (Fig. 5). In 123 patients recoveringfrom general or spinal-epidural anesthesia, 77% of pulse oximeter alarms werefalse in nature, which the investigators attributed to sensor displacement,motion artifact, and a decrease in skin perfusion .In this study, the alarm threshold was set at anSpO2 of 90% and it is not clear if a minimumduration was specified. A recent study in 647 patients in the recovery roomcompared the influence of two pulse oximeter lower alarm limit settings(SpO2 90% = group 90 andSpO2 85% = group 85) on the incidence ofhypoxemia. Although the number of audible alarms waslower in group 85, hypoxic episodes (defined asSpO2 ≤ 90% lasting > 1 min) weremore common in group 90 than in group 85 (11 versus 6%, respectively). Theinvestigators concluded that decreasing the alarm limit to reduce false alarmsmay lead to increase in more relevant episodes of hypoxemia. Various methods have been employed to reject motion artifact but havemet with little success [8,42,43]. An innovative technological approach, termed Masimo signal extraction technology (SET™;Masimo Corporation, Mission Viejo, California, USA), was recently introduced toextract the true signal from artifact due to noise and low perfusion .This technique incorporates new algorithms for processing the pulseoximeter's red and infrared light signals that enable the noisecomponent, which is common to the two wavelengths, to be measured andsubtracted. When tested in healthy volunteers during standardized motion,Masimo SET™ exhibited much lower error rates (defined aspercentage of time that the oximeter error exceeded 5%, 7%, and 10%) anddropout rates (defined as the percentage of time that the oximeter provided noSpO2 data) than did the Nellcor N-200 andNellcor N-3000 oximeters (Nellcor Puritan Bennett, Pleasanton, California, USA)for all test conditions . The lowest performanceindex (defined as the percentage of time that the oximeter's value waswithin 7% of the control SpO2 value) was 97% forMasimo SET™ comparedwith 47% for the N-3000 and 68% for theN-200. In 50 postoperative patients, Dumas et al  observed that a pulse oximeter's alarm frequency wasdecreased twofold with a Masimo SET™ system versus aconventional oximeter (Nellcor N-200). Improved performance was particularlystriking during conditions of gross (non-rhythmic) motion and tremor, when a22-fold reduction in signal loss over time was observed (Fig. 6). Inaccurate oximetry readings have been observed in pigmented patients,but not by all investigators . In 33 healthy blacksubjects during normoxia and hypoxia, the correlation betweenSpO2 and SaO2 wasinferior with a Biox IIA oximeter (Ohmeda, Boulder, Colorado, USA) (r= 0.80) than with the older Hewlett-Packard (Waltham, Massachusetts, USA)(non-pulse) oximeter (r = 0.94) . Incritically ill patients , bias ± precision wasgreater in black patients, 3.3 ± 2.7%, than in white patients, 2.2 ±1.8%; also, a bias > 4% occurred more frequently in black patients (27%) thanin white patients (11%). Low perfusion states, such as low cardiac output, vasoconstriction andhypothermia, may impair peripheral perfusion and may make it difficult for asensor to distinguish a true signal from background noise. In cardiac surgerypatients experiencing hypothermia and poor perfusion, only two of 20 oximeters(Criticare CSI 503, Criticare Systems, Inc., Milwaukee, Wisconsin, USA; DatexSatlite, Datex Instrumentarium Corp., Helsinki, Finland) provided measurementswithin ± 4% of the CO-oximeter value .Measurements of SpO2 with a Biox 3700 oximeter had a bias > ± 4% in 37% of patients receiving vasoactive therapy . An under-recognized and worrisome problem with pulse oximetry is thatmany users have a limited understanding of how it functions and theimplications of its measurements. In a recent survey , 30% of physicians and 93%of nurses thought that theoximeter measured PaO2. Some clinicians alsohave a limited knowledge of the O2-dissociation curve,andthey do not recognize that SpO2values in the high 80s represent seriously low values ofP a O2. In the above survey, some doctors andnurses were not especially worried about patients withSpO2 values as low as 80% (equivalent toPaO2 ≤ 45 torr). Number of false alarms for devices used to monitor respiratoryrate, mean systemic blood pressure from an arterial catheter, heart rate froman electrocardiogram (EKG), heart rate measured by pulse oximetry (POx) andO2 saturation measured by a pulse oximetry(SpO2). Forty-five per cent of all false alarms were dueto the SpO2 signal. Data from . 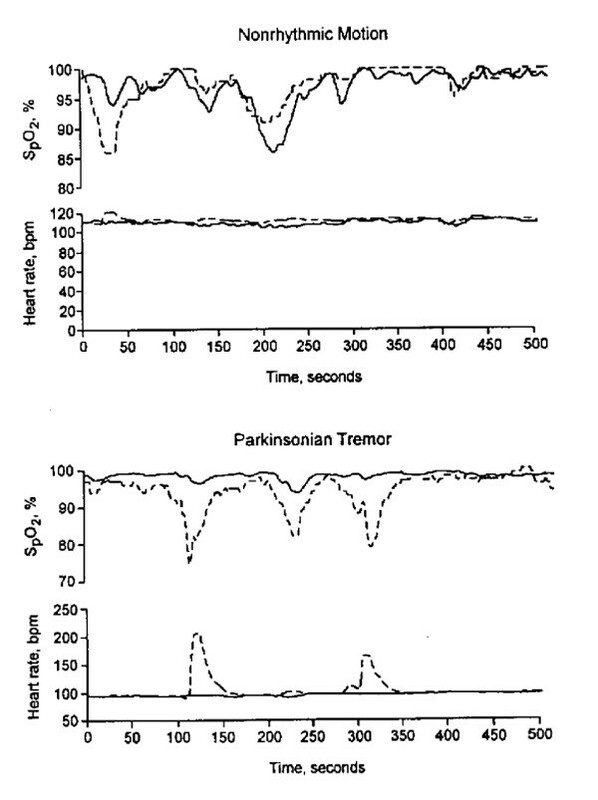 Artifactual pulse oximetry signals during nonrhythmic motion(i.e., gross arm motion; top panel) and during Parkinsonian tremor (lowerpanel). Solid line denotes Masimo signal extraction technology(SET™), aimedat minimizing spurious pulse oximetry readingsdue to motion artifact; dashed line denotes conventional pulse oximetry.Spurious changes in SpO2 were less with MasimoSET™ than with conventional pulse oximetry. Published withpermission . Cullen et al. demonstrated thatthe introduction of pulse oximetry to areas where anesthesia was administereddecreased the overall rate of unanticipated admissions to the ICU. Molleret al. conducted the first prospective,randomized study of pulse oximetry on the outcome of anesthesia care in 20 802surgical patients. A 19-fold increase in the detection of hypoxemia (defined asan SpO2 < 90%) was noted in the oximeter groupthan in the control group. Myocardial ischemia was more common in the controlgroup versus the oximetry group (26 and 12 patients, respectively); however,pulse oximetry did not decrease the rate of postoperative complications ormortality. In general care units of a university hospital, Bowton etal. reported that 75% of patients had at leastone episode of desaturation with SpO2 < 90%,and 58% had at least one episode with SpO2< 85%. Despite these events, few nurses, and even fewerphysicians, made mention of these hypoxemic episodes in their clinical notes.Moreover, the decrease in SpO2 values rarelyresulted in a change in respiratory care orders. Pulse oximetry can assist with titration ofFiO2 in ventilator-dependent patients, althoughthe appropriate SpO2 target depends on apatient's pigmentation . In whitepatients, anSpO2 target value of 92% predicts asatisfactorylevel of oxygenation whereas, in black patients, this target mayresult in significant hypoxemia. While a higher targetSpO2 value (95%) avoids hypoxemia in blackpatients, some will have P a O2 values as high as198torr (Fig. 7) and, if receiving a highFiO2 to achieve theSpO2 target of 95%, O2 toxicity mayresult. The potential usefulness of pulse oximetry as a screening tool thatcould supplement or supplant respiratory rate as a 'pulmonary vitalsign' was investigated . Paired measurementsof respiratory rate (counted while auscultating breath sounds for 1 min) andSpO2 were obtained in over 12000 adult patientsin the triage area of an Emergency Department . Therelationship between SpO2 and respiratory raterevealed correlation coefficients of 0.378 to -0.454 with a weighted mean of-0.160, in other words, a weak inverse relationship betweenSpO2 and respiratory rate. Overall, only 33% ofpatients with an SpO2 below 90% exhibited anincrease in respiratory rate (defined as any rate in the upper five percentileby age). The study confirmed previous observations [55,56] that respiratory rate alone isnot accurate in detecting hypoxemia. The usefulness of pulse oximetry as a means of screening forrespiratory failure defined as P a O2 <60 mmHgand P a CO2 > 45 mmHg in patients with severeasthma was examined . Respiratory failure occurredin six patients out of 82 (7.3%) with an SaO2> 90% versus only three out of 72 (4.2%) patients with anSaO2 > 92% (P < 0.005). Theinvestigators concluded that an SpO2 > 92%suggests that respiratory failure is unlikely and therefore arterial blood gasmeasurements are unnecessary when evaluating patients with acute severe asthma.Interestingly, this threshold value of 92% is the same target value thatpredicted reliably a satisfactory level of oxygenation during titration ofFiO2 in ventilator-dependent patients . 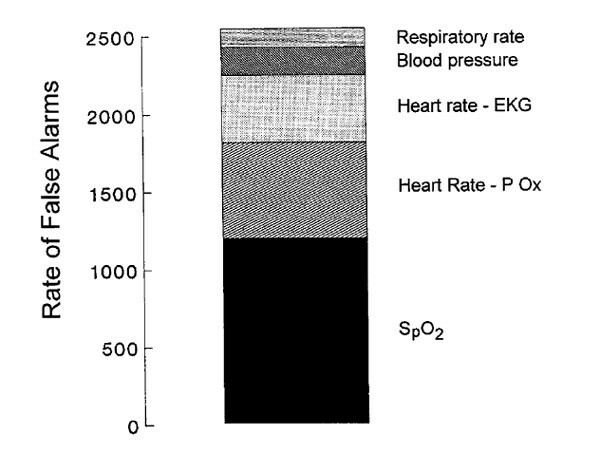 Arterial oxygen tension (PaO2) values atpulse oximetry O2 saturation (SpO2) value of90, 92, 94, and 95%. The inspired O2 concentration(FiO2) was adjusted until the desired steady-stateSpO2 value was achieved. The solid horizontal linerepresents the mean PaO2 value obtained for eachSpO2 target. The closed and open circles represent valuesobtained in black and white patients, respectively. In whitepatients, anSpO2 target of 92% resulted in a satisfactory level ofoxygenation, whereas a higher SpO2 target, 95%, wasrequired in black patients. Published with permission . Bierman et al. reported that fewerarterial blood gas (ABG) samples were obtained in cardiac surgery patientsifSpO2 data were available to the caregivers.Interestingly,the availability of oximetry data had no effect on the durationof ICU stay, duration of mechanical ventilation, or the need for supplementalO2. In an emergency department, a recent report showed that thenumber of unjustified ABGs (as determined by independent experts) over a2-month period decreased from 29% when pulse oximetry was unavailable to 12%when oximetry was available; the number of justified ABGs did not change . Solsona et al. measured thenumber of blood gas measurements in 417 patients admitted to a medical-surgicalICU during a 12-month period in which only two pulse oximeters were available(i.e., control period). They then studied 306 patients admitted over a 9-monthperiod when 12 pulse oximeters were available for the same number of beds(i.e., intervention period). Less frequent use of mechanical ventilation and aslightly lower number of arterial blood samples were observed when pulseoximetry was fully available. Inman et al. examined the effect of implementing pulse oximetry without any specificalgorithm for its appropriate use. They studied 148 patients before theimplementation of oximetry in their ICU and 141 patients after itsimplementation. The number of ABG samples decreased from 7.2 to 6.4 per patientper day, a reduction of only 10.3% compared with average reductions of 39% inthe previous studies [4,61]. Thissuggests that, without explicit guidelines, the pulse oximeter was used inaddition to, rather than instead of, ABG samples. Pulse oximetry is probably one of the most important advances inrespiratory monitoring. Over the last 15 years, numerous studies have focusedon the technical aspects of pulse oximeters and found that these instrumentshave a reasonable degree of accuracy. This degree of accuracy, coupled with theease of operation of most instruments, has led to the widespread use of pulseoximetry for monitoring patients in the ICU. Perhaps the major challenge facingpulse oximetry is whether this technology can be incorporated effectively intodiagnostic and management algorithms that can improve the efficiency ofclinical management in the intensive care unit.